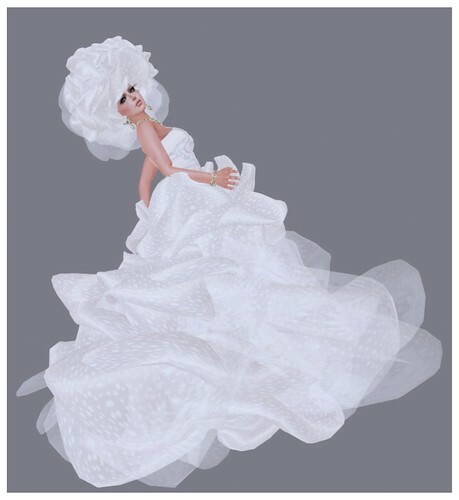 Leezu has just released the Noell Sculpted Dress and it's fantastic. A friend showed me Leezu's tutorial website, where she shows you how to make the Noelle top texture. I tried to follow it, but got lost after a couple of steps (my own fault since I can barely navigate PS). But I'm glad I didn't have to make this dress myself, it's so gorgeous and includes a big poofy sculpted skirt and matching flower hat. Shown here is the Leezu Noell Sculpted Dress in Champagne and Violet. This dress can be worn as a wedding dress or an evening dress. The hat is a great touch, I really wish more designers did this, or some type of matching hair accessory. Here's an older release, the Leezu Ginko Flexi Dress in Orchid. Leezu's designs are fun & original, and I totally have a soft spot for big poofy gowns. 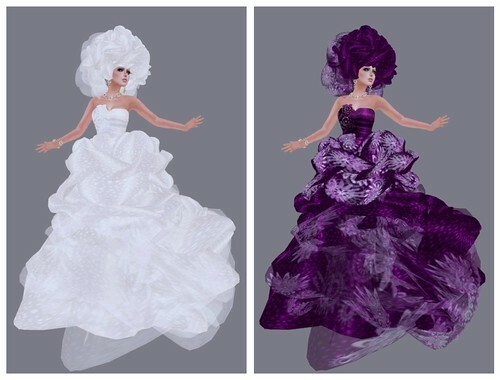 This dress comes with a hair flower & 3 different types of skirts. The first picture of you in this post is absolutely breath taking .. they are all lovely but that one … stunning!!! Your face is gorgeous.